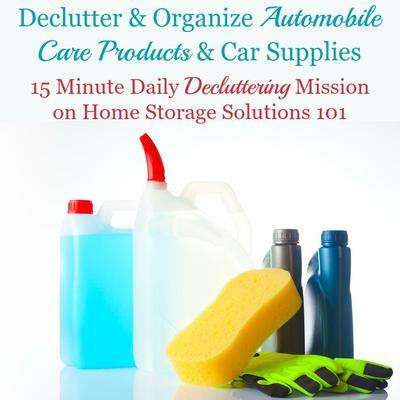 Today's mission is to declutter and organize car care products and auto supplies that you store in your garage, in your car, or wherever else you keep them. 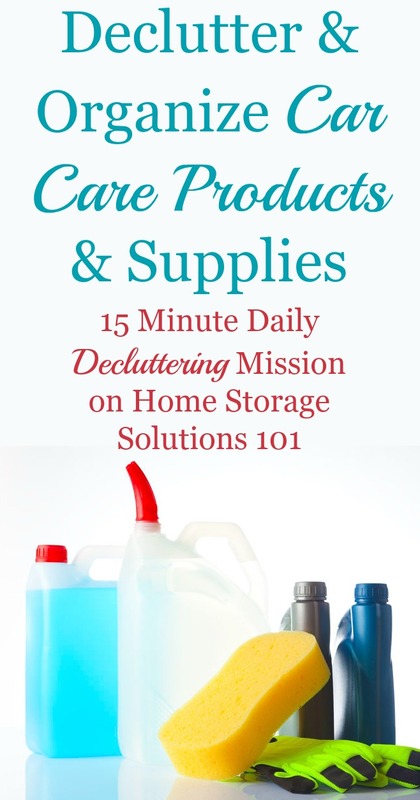 I've designed this mission to be completed while working through the Garage Organization Challenge here on the site, which is one of the 52 Week Organized Home Challenges. I did that because auto care products are often kept in the garage. Therefore, you can do this mission while generally decluttering your garage. The types of things I have in mind for you to declutter and organize, when deciding this was an important mission, include items you've purchased for car maintenance, as well as cleaning and general care of your vehicles. Obviously some people have a lot more of these products than others. My Dad absolutely enjoyed washing our cars when I was a kid, plus he enjoyed being what he always referred to as a "shadetree mechanic" so we had a lot of this stuff in my childhood garage. On the other hand, now in my own home, I don't keep a lot of stuff like this in my garage because I don't personally work on my own cars much. But I do have some basics, such as car wash soap and car wax, as well as windshield washer fluid, coolant, and some extra motor oil for just in case. You know what you've got related to your vehicles, and today's the day to declutter anything too old to use, or broken, or that doesn't even work for cars you still own. Only after you declutter what you no longer want or need is it time to organize what you've got left (because as always, I'm not asking you to get rid of it all). Once you're ready to organize gather up the rest of these car products into one location and organize it so you'll always know where all these supplies are in the future when you need them. While decluttering these types of things is, in theory simple, you do need to realize that unlike general trash you've got to properly and safely dispose of automotive fluids and certain car cleaning products, since many of them are considered hazardous waste. Therefore, below I've provided a bit of information on this step so you declutter things safely. 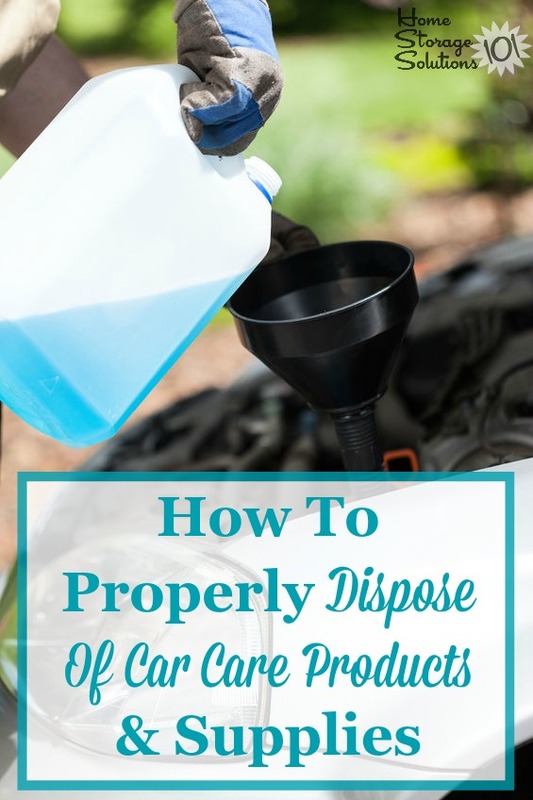 As I stated above, once you've gathered up all of the automotive products that you plan to get rid of you need to make sure you properly and safely dispose of them, which most of the time is not just throwing them in the trash. First, for any products that are still good, and unopened, but that you personally have decided you don't need to keep in your home, see if you can find a place to donate them. Because having them used, by someone, is better than just disposing of them, even if it is done safely. However, for any types of items that you do need to dispose of the key is to do a little research first to make sure you're following all applicable laws and environmental regulations, as well as keeping yourself and your family safe. For example, antifreeze and coolants are dangerous for pets and children because they are poisonous, yet taste sweet, so keeping such items out of reach during both storage and disposal is important. Similarly, many automotive fluids are flammable or corrosive, so again, following common sense safety measures is mandatory. Here are some general safety rules to keep in mind when dealing with any type of automotive fluid. 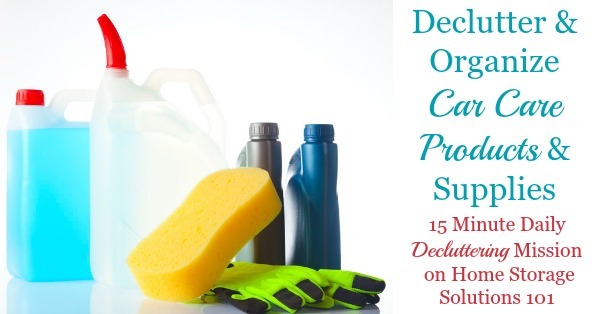 It is difficult to say definitely how you should dispose of various car maintenance products and automotive fluids because of the fact that each area of the country, and the world for that matter, has different laws, regulations, and procedures for disposal. Typically though, as long as you know what you've got, you're going to be able to find out quickly and easily how to properly dispose of these things. That's because, already, professional mechanics and others in the car maintenance industry are heavily regulated in how they are required to dispose of these exact same types of products. That means in your area there are already developed procedures in place that you can follow once you ask the right person who can tell you what those procedures are. Typically, many of these items are recycled and repurposed, or if not, you want to get them into the hazardous waste disposal system, so they can be disposed of more safely for the environment. Many auto parts stores accept used motor oil and other car fluids for recycling or disposal, but not all. Check with these types of stores first, because this can be the easiest way to deal with these types of products. Another possibility is to contact your local waste management company, or municipality to determine how to dispose of these items. Many times they have drop off locations, or scheduled pick up times for these products, although sometimes it isn't very convenient and you may need to put the date on your calendar to remember when it is later. If they don't have these available they should also have more contact information for additional places you can call to make sure you get these items into the proper disposal channels. In addition, your local city hall or county government office may also have this type of information available on municipal websites. I hope this information has inspired you to declutter your garage, including all of the car care items you may have stored there.